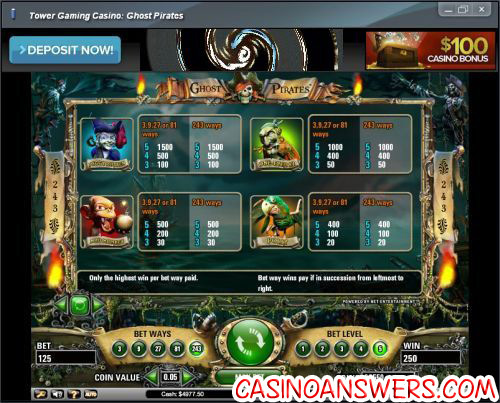 Ghost Pirates Video Slot Guide & Review - Casino Answers! Ghost Pirates is a 5-reel, 243-way video slot developed by Net Entertainment, featuring wild symbols, scatter wins and a free spins feature with a 3X multiplier. 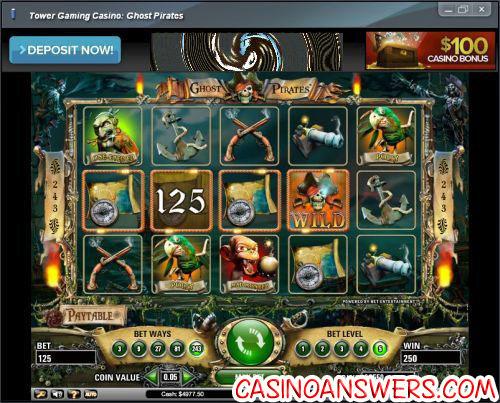 You can play the Ghost Pirates video slot game at Tower Gaming Casino and Betsson Casino. Bets on the Ghost Pirates video slot are $0.01, $0.05, $0.10, $0.25, $0.50 and $1. Ghost Pirates is not a payline slot machine, but a way slot machine. You can choose 3 ways (1 coin minimum), 9 ways (3 coins), 27 ways (8 coins), 81 ways (15 coins) and 243 ways (25 coins). Each setting will activate one more reel than the previous with the middle row always active. Casino Answers recommends playing all 243 ways to maximize your payouts on some of the symbols. You will also have to choose your bet level from 1-5. You can keep track of what your total bet is by looking below the game buttons. The lowest total bet possible on the Ghost Pirates slot game is a penny per spin up to highest total bet of $125 per spin. To play all 243 ways at the fifth bet level, hit the “Max Bet” button. For other bets, press the Spin button (with the arrows going in a circular motion). The highest paying symbol on the Ghost Pirates slot machine is the Peggy Rotten symbol. No matter how many ways you are playing, if you hit 5 Peggy Rotten symbols, you will win the top jackpot of 1500 coins. The One-Eyed Ed symbol is another high paying symbol at up to 1000 coins. The wild symbol is the Ghost Pirates Skull & Crossbones logo symbol. It will substitute for any symbol on the Ghost Pirates video slot. The scatter symbol on Ghost Pirates is the Treasure Chest symbol. It will pay out up to 50X your total bet. On 243 ways, you can win 15, 20 or 25 free spins for 3, 4 or 5 scatter symbols. If you’re playing less than 243 ways, you can win 10, 15 or 20 free spins. All free spins will have a 3X multiplier. Trigger the free spins feature on the Ghost Pirates slot game and win big at Tower Gaming Casino! Hit the “Auto” button to play 10, 25, 50, 75 or 100 autoplay spins on the Ghost Pirates slot game. You can open up the advanced settings button to stop autoplay on any win, if you trigger the free spins, if a single win exceeds (any amount you input) and if cash increases/decreases by (any amount you input). You can stop autoplay at any time. Ghost Pirates looks and sounds great, although its top payout isn’t that high and it lacks a bonus game. Of course, it has a very cool theme that makes the video slot a lot of fun to play, which is something Net Ent does very well. To play the Ghost Pirates video slot, sign up and make your first deposit today at Tower Gaming Casino! Are USA players able to play the Ghost Pirates slot machine for real money? Unfortunately, players from the United States are unable to play the Ghost Pirates slot game for real money at this time. For a pirate-themed video slot that American players can play, please read our X Marks the Spot Video Slot at Crazy Slots Casino. Can I play a free Flash game of the Ghost Pirates video slot? You can play a Flash game for real money or for free at Tower Gaming Flash Casino and Betsson Flash Casino. If you have issues playing the free Flash game, you can download the latest version of Adobe Flash Player and that should take care of any problems you might have. Can Macintosh players play the Ghost Pirates slot game? Absolutely! Mac players not only have the option of playing the Instant Play Flash version, but they can also play the downloadable Mac client at Tower Gaming Casino. Where can I play the Ghost Pirates online slot machine? You can play Ghost Pirates at either Tower Gaming Casino and Betsson Casino. For more information on these casinos, please read our Tower Casino Review and Betsson Casino Review. Where to play the Ghost Pirates Video Slot Flash Game?